Retro Gamer is a UK magazine that dedicates itself to… well… retro games. 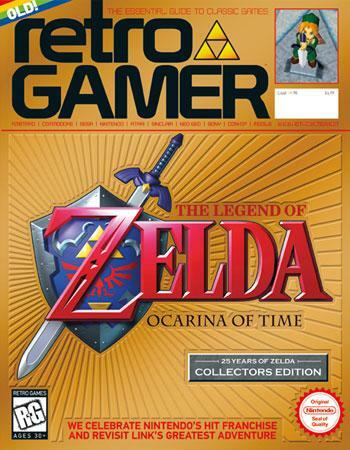 The 90th issue of the magazine releases this month and Ocarina of Time hits the front cover. You can click the image to the left to see a larger version of the gorgeous cover artwork. Here are the few tidbits from Retro Gamer’s website of all the Zelda goodies that will be found inside. –Retro Gamer celebrates 25 years of The Legend Of Zelda. Don’t you dare miss it. –We celebrate the incoming release of Ocarina Of Time 3D with an in-depth look at the incredible N64 original. –Ashley Day travels back to 1986 and pays tribute to the NES game that kicked off one of Nintendo’s biggest franchises. UPDATE: A commentator at GoNintendo posted a video highlighting some of the goodies in this months issue of Retro Gamer Magazine. You can see the video after the jump. This raises the question of what is a retro game? To me personally, when I hear the term retro game, two things come to mind. The first are classic arcade games in the 1980’s, and if I’m thinking a bit more modern, 2d Console titles from the NES and SNES period. What I certainly don’t think of is Nintendo 64 titles and Ocarina of Time in particular. In the lifespan of video games, I still feel Ocarina of Time is a relatively new game. It appears the folks at Retro Gamer have a different idea of what a retro game is. Just a few months back the cover article for their issue was A Collector’s Guide to the N64. Now I know this isn’t really that important of an argument, but I’m not quite ready to place the Nintendo 64 in the era of retro games. By definition retro just means that it is something from an earlier time period, which in the case of the Nintendo 64, I guess that fits the criteria. To me personally, many of the Nintendo 64 titles look, play, and feel more like what we are playing today, as opposed to what we played 20-30 years ago. Nevertheless, it’s nice to see Zelda getting some extra love. The new magazine is on sale in stores within the UK. Unfortunately, I don’t have a copy of the magazine, so I have nothing to preview just yet, but if you are in the UK, this might be a goody for you to pick up. Ocarina of Time 3D is set for release on June 19th here in United States, with dates of June 16th and 17th for gamers in Japan and in the UK. Stay tuned to Zelda Dungeon for all the latest Ocarina of Time 3D news and media.